Ryland Homes Las Vegas has 40th anniversary celebrations throughout the year. Ryland Homes in Las Vegas real estate is offering 40 percent off new home mortgage payments for two years on Las Vegas home purchases at West Park Las Vegas, a new real estate development within Summerlin Las Vegas. Montage in West Park offers two- and three-story new homes for sale in five designs, ranging from 1,659 to 2,103 square feet. Priced from the high $300,000s, the Summerlin homes are accented by European-style courtyards and offer side-access garages. 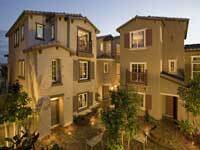 Montage Las Vegas homes for sale by Ryland Homes gives every Summerlin home buyer a dream. Michael Ibasco, it was the pairing of an urban lifestyle with the natural beauty and wide open space of Red Rock Canyon next to Red Rock Resort Las Vegas.